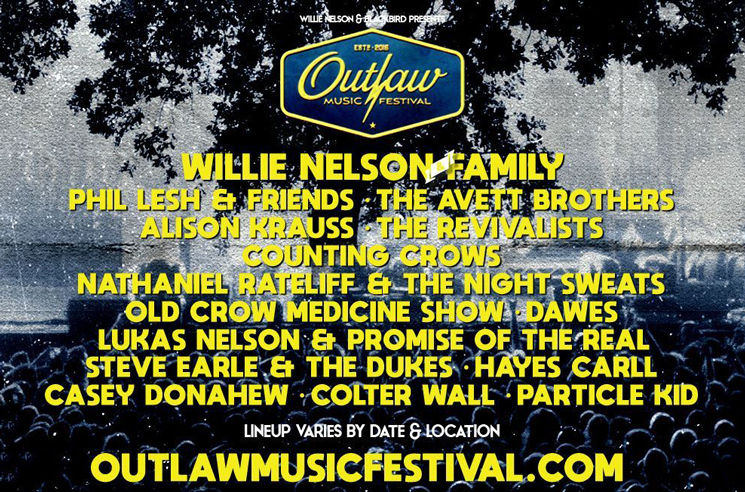 After bringing the likes of Sturgill Simpson, Tedeschi Trucks Band and Terra Lightfoot to Toronto last year as part of the Outlaw Music Festival, Willie Nelson has now revealed the lineup of acts set to return to the city for the travelling event's 2019 edition. The tour's summer leg features a date at Toronto's Budweiser Stage on June 21, when there will be feature performances from Willie Nelson & Family, the Avett Brothers, Alison Krauss, Matt Mays and more. Other dates on the tour feature the likes of Phil Lesh & Friends, the Revivalists, Counting Crows, Nathaniel Rateliff & the Night Sweats, Old Crow Medicine Show, Lukas Nelson & Promise of the Real, Steve Earle & the Dukes, Colter Wall and more. Each stop on the tour promises "an unforgettable concert experience" that includes "a unique range of festival attractions including local cuisine, craft beers, and crafts by local artisans." Tickets for all dates go on sale Friday (March 8) at 10 a.m. local time. Further ticketing and individual lineup information can be found through the festival's official website.